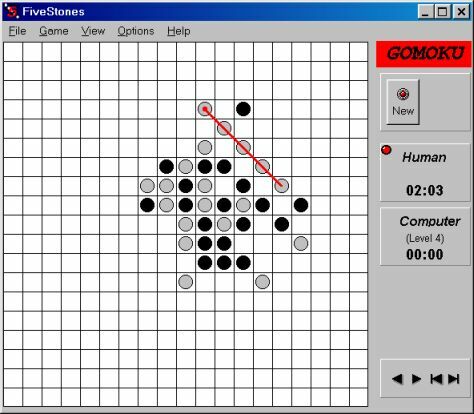 Five Stones is a computer program for playing go-moku and renju. Online version of Five Stones is available here. Go-moku is an ancient game, its roots lie in China and Japan. By now, it is also popular in several countries of Europe and the former Soviet Union. Part of go-moku's popularity must be ascribed to the fact that it can be played with pencil and paper, allowing it to be played everywhere and by everyone. Go-moku is a two-player game, related to the well-known trivial game of tic-tac-toe. While in tic-tac-toe players must create a line of three consecutive stones of their color on a restricted 3x3 board, in go-moku players must create a line of five on a practically unrestricted lattice. When the players got stronger they found that playing with the "completely free" rules was in great favour of Black (the beginner of the game). It is also proved that there is a sure win for Black when playing with "completely free" rules. So in professional variant of go-moku - renju - was accepted some restrictions for Black to make the chances of players equal. Five Stones is a freeware program and is provided at no charge to the user. Below are links to download the program, there are two versions - for the Windows and for the Linux. Linux version was written on Harbour, HwGUI and C, it is built on Fedora 15 and was tested on AspLinux 14, Fedora 16, Debian 6.